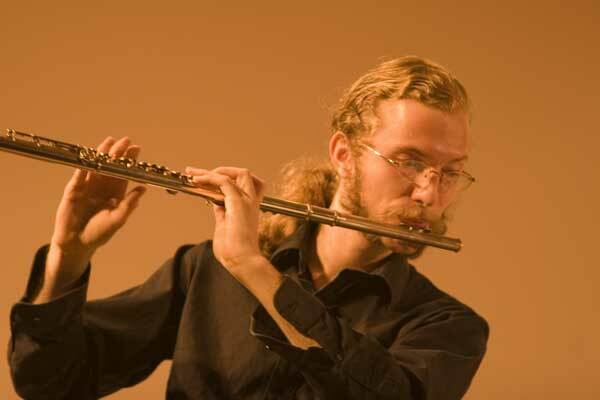 Flutist of the Manhattan Chamber Soloists, Albert Manders enjoys a versatile career as a composer and performer of the classical, contemporary and jazz repertory. Born in the Netherlands, Albert holds a diploma from the University of Pittsburgh, U.S.A., where he appeared as a soloist with the University Orchestra. For two years he served as flutist for the Pittsburgh Youth Symphony Orchestra under such conductors as Marin Alsop, Mariss Jansons, and Alastair Willis. As a recitalist, Albert performs throughout the United States and Europe and has appeared in prestigious festivals including Domaine-Forget (Quebec) and the National Youth Orchestra Festival (U.S.A.). He is also a dedicated chamber musician, formerly associated with the Aeolian Winds of Pittsburgh in their tours throughout Pennsylvania and Maryland, and frequent radio appearances. Beyond classical music he has participated in a wide range of musical groups playing celtic, klezmer, and improvised music as well as the rock/jazz band of modern dance group Attack Theatre under the musical direction of Dave Eggar. Of particular fascination is experimenting with finding new sounds and modes of expression. Albert began his musical studies on the flute at the age of 8 in Pittsburgh, Pennsylvania. Since then he has attended many masterclasses including those of Jeanne Baxtresser, Peter Lloyd, Chris Norman (wooden/celtic flutes) and The International Holland Music Sessions. Since 2006 he has lived in the Netherlands where he studied contemporary flute technique with Anne Le Berge and Wil Offermans. In 2000, Albert Manders was named winner of the Premier Prix at the Duquesne Chamber Music Competition as a member of the Manders-Rodgers Duo. Beyond playing the flute, Albert is involved in the arts in many other ways. His compositions have been performed in the US, Netherlands, and France. As a founding member of NATAL, he directed and performed in a music and dance happening in a Dutch castle ruins. He continues to create multidisciplinary art projects with Peruvian photographer Nathaly Bustamante. As a university student he also was active in theatre, acting in plays and musicals as well as creating the sound design for a number of productions. Having studied business in college, Albert is involved in the field of arts management. In positions from marketing to corporate sponsorship he has worked for organizations such as Pittsburgh Opera and the International Jewish Music Festival. Currently he runs his own cultural experience and music administration business.